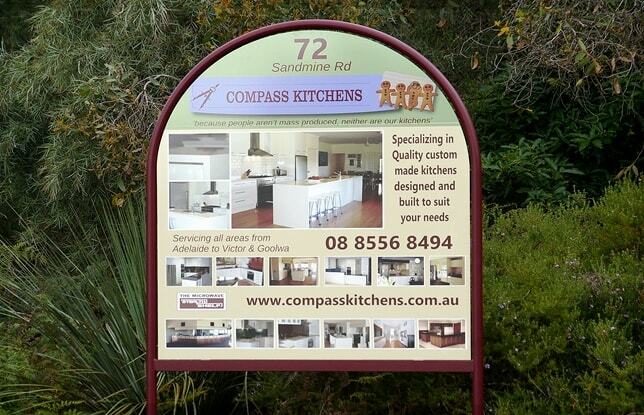 Kitchen Renovations in Adelaide | Hand Crafted French Provincial. 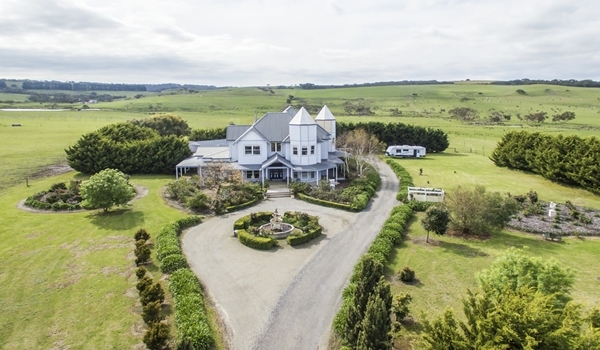 Our clients built a lovely new home on their farm situated on the Fleurieu Peninsula. They chose this French Provincial Style kitchen to suit their house design, fitting in perfectly to this bright and airy home; and their Kitchen being the focal point of their large open plan family living space. For this new home, we built this bespoke Kitchen and finished it with a hand painted off white colour typical of this style. 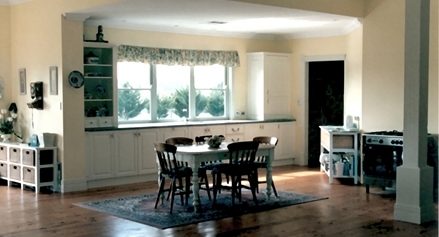 The first stage of this build incorporated the cabinetry along the window wall including a fully integrated dishwaher. This section we originally installed with a Blue Terrazzo Roll-Formed Laminate Benchtop; all in keeping with this French farmhouse style home but keeping within our client's budget. This kitchen forms an integral part of the living area and was made over a period of time for our clients as they built and as their budget allowed for each stage. For the second stage we were asked to come back and make additional sections for the Kitchen, which included a large Island Bench Unit with an additional 9 deep drawers providing lots of easy access storage. The new large Island bench unit has a plinth base, seating space and a natural Adelaide Black Granite Benchtop. 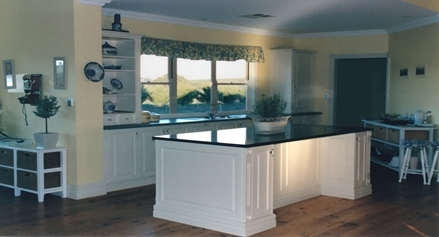 With this third stage our clients loved the Granite so much that we soon replaced the original Blue laminate bench top along the window with more of the same Adelaide Black Granite which was quarried in the South Australian Murraylands. We were later asked to come back for a Fourth time as their home building project progressed; this time to finish the remaining Kitchen cabinetry on the angled wall to this lovely Kitchen. This latest addition also included a matching office workstation situated directly adjacent to the kitchen & dining area; whereby increasing the functionality of this very versatile living space. Our client has asked us to incorporate several new features into this kitchen, where these included, a new Oven Range built into the custom Inglenook we made with a Hand Carved mantle and a concealed Rangehood. We have also provided yet more wrap-around bench space, storage cabinets and display units adjacent to this Oven along the angled wall at the back. Here we also made for our client new cabinetry for a concealed Microwave Oven, small Apothecary Drawers, more overhead units and more useful deep full-extension drawers with matching Provincial Bolection Mould fronts. We have also now incorporated into the new cabinet work a Bosch built-in Coffee machine as well as a custom pull-out a Stealth Shelf built-in below so to provide added work space when needed. 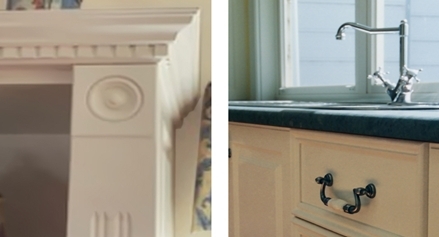 All cabinets are detailed with our spindle moulded French Provincial Style Reided End Columns which also have Roundel Moulded capitals. 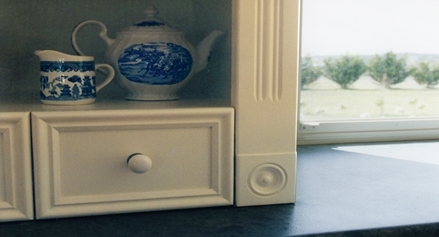 In keeping with this classic French Provincial Style we have also used features for our clients that include the typical blend of Provincial Porcelain T Handles, Knobs and Drop Handles, plus a Provincial Monobloc Tap and detailed Dentil Head-Mouldings, which gracefully provide those all-important finishing touches to this classic style. The range of images here are a mixture taken during the various stages in the making of this beautiful kitchen. 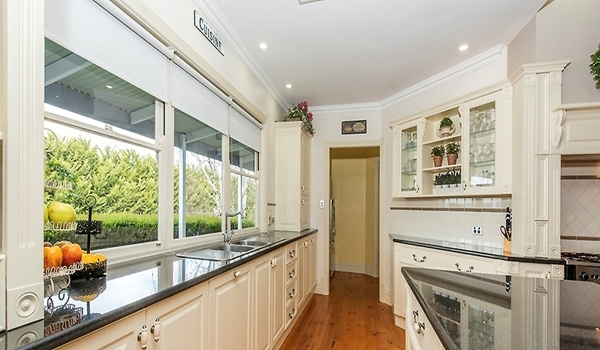 With this quality Bespoke home and our cabinetry being completed, this property has recently sold for $2.28m.